Mmmm, MrBenn. I know there is one person who would support this. I'm wondering if there would others who'd support this to get it finished? I'd support it but I think there needs to be a reduction in the complexity of the map. For example, why have different years for the accusers and why not group them all into simply "the accusers." Industrial Helix wrote: I'd support it but I think there needs to be a reduction in the complexity of the map. For example, why have different years for the accusers and why not group them all into simply "the accusers." Because that would decrease the number of "continents" on the map. And since this is an historical map, i'd like to retain that aspect and sense of history. I'm sorry if it is confusing for you. You know, I think you should get rid of most of the army circles. The territories are light enough to do without, and it would simplify the visual composition of this map significantly, I think. natty_dread wrote: You know, I think you should get rid of most of the army circles. The territories are light enough to do without, and it would simplify the visual composition of this map significantly, I think. Yes netty. I was experimenting with lowering their opacity, but removal althogether is a good option. But i'm not also happy with the overall colour scheme. so i will be adjusting that. The test will come when numbers are on the regions. Version 6 with some new colours and army digits to see how it would look without army circles. thanks aon. i've got to try to figure out a way to work "gossip" in to the gameplay coz that is what all this was about...vicious gossip and tall tales and fear. some sort of inset called "Gossips Corner" where a lot of the known gossips can attack too?... 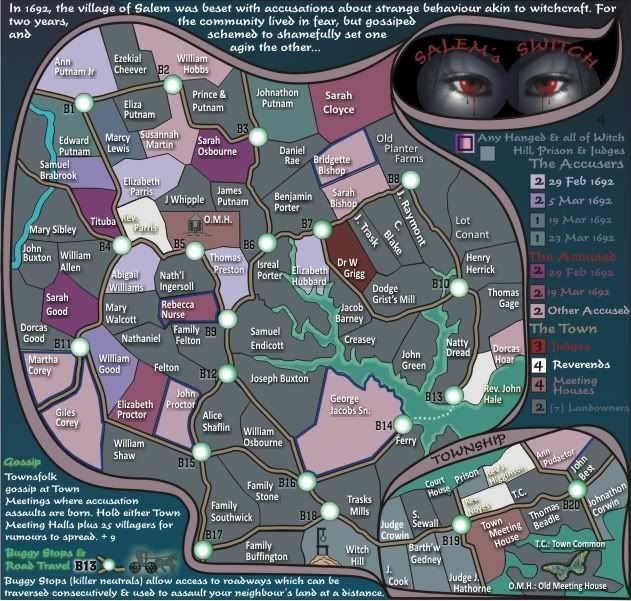 In saleem there are a few kids and women that are known to bad mouth and gossip agains witches... control of gossip corner could be some cool bonus... too bad we (you) are limited by the xml structure here, you could do some really really cool stuff with this. There is a movie that is new called... hmm i cant think of the name but it was about the plague in europe and witches... hmm maybe it was called "Plague" or "Black Plague".. GREAT witch movie.. reminds me of this map.. Also Ive read a lot o the diaries and town logs you can get online from your maps period.. cool stuff. anyway im rambling... thanx again. ps I read so much I bought a nook.. thopught I would hate it, but love it! I have a book on demonology that has a lot of the witch stuf from salaam.. so pretty excited about this. But, the removing of army circles & the colour scheme change is a huge improvement. +2 internets for that! Yes i saw that before, it occurs in the translation from .cdr to .jpg, so i just gotta find another colour . Well, i've experimented with various options all day, and can't go past this basic idea for the Buggy Stops. I've moved the colours around and come up with something resembling where i want this to go. But more importantly, i started developing the "gossip" concept. The bonus needs refining so some suggestions for that would be apprecatied. I think I like the colors better on version 6. Of all the maps to work on next you pick this one. I thought this would please you. Nola_Lifer wrote: I think I like the colors better on version 6. Of all the maps to work on next you pick this one. You are not happy with this map ? May i ask why? Of course this is all personal, but I think the subject matter is ok. You have some other maps that I'd much rather see go through and will be played a bit more. Your WWI map comes to mind or even the Sydney map. As for colours, I think V6 is clearer, probably because of all the contrast. On the other hand I think the cold colour scheme on V7 fits the theme of the map better. Although you could add some bloody red to it, sort of like the judges on V6. The only WW1 map i think hanging around is Gallipoli, and IH has taken that over...i understand he has that on his radar, but is quite busy with other stuff at present. I will put the Sydney map up as i indicated in that thread, but there has to be support for it. i think there is more interest in this map simply because it is US history, even though at present i think the Sydney map looks better graphically. As for other maps, the only other i can think of is the Snowfight map and even after i started that, i'm not sure i have the skills to do the people on it successfully. Yes i agree, but i recall that those colours gave me greif with the CB test and that's why i changed them. ...On the other hand I think the cold colour scheme on V7 fits the theme of the map better. Although you could add some bloody red to it, sort of like the judges on V6. I went ahead and moved this over to the Drafting Room. ironsij0287 wrote: I went ahead and moved this over to the Drafting Room. Yes... I just wonder if you could take the best from both versions... the coldness of V7 but with the increased contrast of V6. Yes i think some more experimentation could occur, but for just now, i'll stick with V7, as it kind of gels. for now though, i have to ask the question re the bonuses....i presently have them as dates. Any suggestion as to an alternative nonemclature for the bonuses? I'll catch up on what I've missed and see if I can't provide a critique or two.